What's it take to go racing Supercross in the 250 class? What's it take to lineup against the fastest 250s in the world? The likes of which are built by Pro Circuit, Star Racing, GEICO, and the Austrian duo of KTM and Husqvarna? Well, we found one of the closest things in the pits, the YZ250Fs of Cycle Trader/Rock River. Since 2014, when Rock River first partnered up with Cycle Trader, they spun their team more from a home for Yamaha-mounted riders, to more of a structured team focused around offering 250s that young or overlooked talent could use to launch their careers to the next level. With this they've forgone searching riders out with money to offer, but instead the chance to get on a 250 that could place them with the top ten and even top five in a Supercross and break the top ten at an outdoor national...the kind of results needed to get onto one of the six factory squads in the paddock. Year-after-year, the team develops their bikes to a higher level in hopes of moving riders on to their dreams, knowing that they will continue to have fresh faces joining the team every year or so. With this in mind, developing a rideable and easy-to-adapt to machine is key with a wide range of riders coming in and out of their tent. After a prior engine lease deal directly with Yamaha/GYTR, the team wanted to go a different route with a program built for their needs and something they could grow with, thus enter their current partnership with Yoshimura. For Yoshimura, working with the Rock River squad was an excellent opportunity to get more R&D time with what's arguably the hottest 250F on the block. This info has allowed them to not only develop an engine for the team that meets and even exceeds their needs, but gives them more products to sell. Any consumer can purchase the entire engine we tested, or something milder...down to just an exhaust. Even on that end, they gained more info on nailing a pipe and silencer that boosts the performance on a machine that's praised by many exhaust manufacturers for the quality of the stock system. So in the end, all this effort has been worth it and made for a great partnership for both parties. The engine itself produces around 18% more peak horsepower than stock and about 20% additional torque. And as you can guess, it's extremely obvious on track. The bike's gearing has been dropped from the stock 13/50 combo to a 13/48 and even with that change, the bike packs the front end all over in third gear. The Yamaha has been always been high up on my personal list due to the ability to ride it in a higher gear through corners than most 250s and Yoshimura's engine package lays down enough usable torque, that you can still carry that gear, even with the two tooth adjustment to the gearing. But with that, you can also hold each gear for much longer than stock. This, along with the ease at which the power rolls on, makes Rock River's YZ250F very easy to ride and allows you to concentrate more on line choice and form, as it has so much more power in such a wider spread than stock. On the stock bike, I'd find myself regularly shifting between second and fourth gear, with the occasional click into fifth...while I was able to go with third and fourth alone with their race bike. And for the occasion I needed to clear something peaky and big right out of the corner, second pulled farther than stock, but pulled so hard from a low RPM to be used out of a tight rut and all the way up a jump face with a good seat bounce. Unlike some built 250s of this level I've tried, it's really focused around ride-ability. 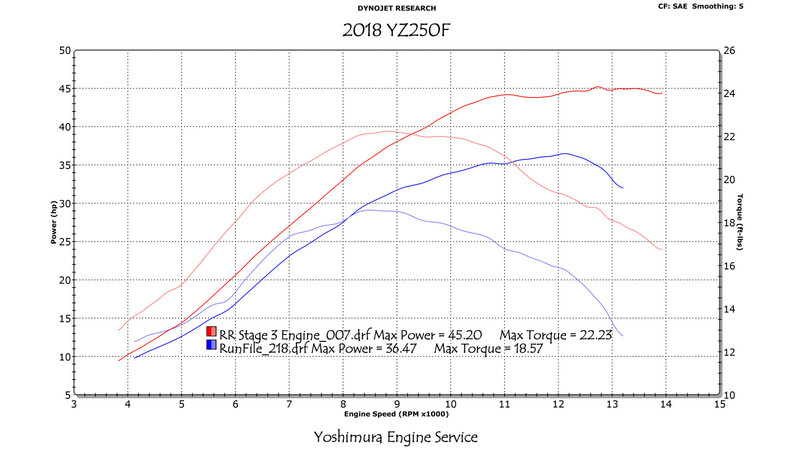 Instead of just looking to put all that punch from mid-to-top and make a 250 that has to be ridden aggressively, the Yoshimura package is so spread out anyone could appreciate the additional power and take advantage of it. As mentioned above, this engine package is available to the public, and the services required to replicate this motor can be found below. Elsewhere on the bike we see another big aftermarket brand in terms of suspension modification with Enzo Racing. Over the years, Ross Maeda's suspension shop has been near-synonymous with Yamaha-based efforts, especially in the 125/250 class. Following in the steps of YOT and Star Racing, Rock River has been working with Enzo for the past five years to build and set up their kit KYB suspension. Amongst the options Ross Maeda offers them on their kit setups is his own shock compression adjuster design and the choice between air and spring forks. For 2018, their bikes used a KYB PSF1 air fork indoors and out. In this case I was riding Brandon Hartranft's bike and he not only outweighs me by around ten pounds, but is quite obviously a bit faster. The initial to mid-stroke of his forks is similar to a setting I would personally use, but the ramp up from mid-stroke on and high speeds is where I noticed a huge difference. I couldn't find a single situation where I put the suspension through enough force to worry me and I needed to push myself to get it to work in high-speed situations. That’s to be expected when testing a bike for someone racing inside the top ten of 250 Supercross and just outside that in Nationals. Outside of the big changes listed are a series of aftermarket brands that cap off the bike. As with many teams in the pits, ARC supplies the levers and clutch perch. While their standard consumer product is already excellent, they also go the extra mile and make custom levers bends, tapers and thicknesses for their riders upon request. These are bolted up to Mika Metals products with their Pro Series 1-⅛-inch handlebars and grips, which is clamped into a set of X-Trig ROCS clamps. Over the past couple seasons, X-Trig has become a popular choice around the pits due to the range of offset options, stem options, great flex characteristic, along with multiple bar mount options and positions. That makes it easy for a team to find something for each rider. As for weight, there are a few big reductions, such as Yoshimura's titanium/carbon exhaust system and GUTS racing's Phantom seat foam (along with their custom seat covers). The team does go through the effort of supplying their riders with bikes liberally sprinkled with titanium, with their bolt kits coming from Superlite Technologies. This brand's a bit newer in moto but is specifically packaged for dirt bikes from DocWob in the UK. A US-based supplier for this titanium brand is MXTire.com. Other brands involved include Asterisk Carbon. Well-known for their knee braces, the brand has ventured into doing skid plates and front brake disc guards...along with their shop being a West Coast home for the team when they're in town. MetalTek welds up their radiators and also customizes their stock pegs to the point you'd swear they're aftermarket, welding in a new and much sharper cleat area, even customizing the height if needed. Rock River utilizes Yamaha's stock hubs by turning down the ridges and cerakoting them for a custom look, then lacing them up to Excel A60 rims. Bolted up to the hubs are Mika Metals sprockets and Galfer brake rotors. Galfer offers a range of sizes, floating vs. non-floating options, pad combos, and whatever else their riders might want to try. The last bit of suppliers include VP for their pro legal Pro 6 fuel, a complete UFO plastic kit, Moose Racing bling kit, Dunlop tires, a G2 Ergonomics throttle tube, DT-1 filter and cage, along with some goodies from GYTR. And last but not least, something synonymous with the Rock River team, their Roost MX graphics kits. Check out the list below for all the suppliers and the full engine build sheet. Man, that engine package sounds incredible for a vet rider. Nice review. Great read. I rode Alex Martin's bike a few years ago and was impressed even though I am 6'2" and everything was lowered and cut short but still enjoyed it. it surprise me they use a tamer throttle control on a 250 instead of a quick one ? Also can we get one of this front brake carbon cover from Asterix ?